The loading and unloading of tankers with petrochemical fluid ranging from crude oil to cryogenic LNG is a daily occurrence throughout the world. However, it is an operation fraught with danger due to the combination of high flow rates, relatively short distances and intermittent operation. Industry regulations require transfer flow to be stopped rapidly in the event of any emergency, which often means valve closures of around 5s and the generation of high and rapidly applied surge pressures / pipe loads. Experience has shown the potential for damage to pipework and/or hoses, spillage and failure of equipment. Excessive surge pressures caused by Ship ESD Valve closure causing damage to loading hoses or arms, loading buoy and feed pipework. High surge pressures caused by closure of Marine Breakaway Couplings or Loading Arm PERC Valves following ship disconnection causing damage to loading hoses or arms, loading buoy and feed pipework. Low pressures and possible vapour pocket formation following unplanned pump trip. High pressures during pump start up, particularly of concern if there are any vapour pockets formed during the connection which will lead to high pipe forces. Check valve slam at the pumps or along the system during rapid flow changes. Excessive pipe loads and pipe movement caused by high pressures and rapid pressure changes. Unstable operation due to control valve misuse or mis-setting. Low pressures caused by closure of valves upstream of the system. Review and optimisation of the system’s steady state design. Review and definition of optimum start up and shutdown sequences. Surge analysis of the system under normal and abnormal operating conditions including a ship ESD. Sizing and installation of surge alleviation equipment such as surge relief valves, accumulators or spring relief valves. Definition of acceptable closure times for system ESD valves and breakaway coupling closures. Optimisation of high pressure trip sensors to shutdown pumps and close ESD valves to reduce surge pressures. Optimisation of ship to shore links. Review of leakage and lost volumes in the case of a system failure. As with all types of projects Hydraulic Analysis Limited would be pleased to offer a free appraisal of any scheme given some basic details of the system’s layout and operation. A number of key personnel in Hydraulic Analysis Limited hold SIGTTO approved qualifications to operate LNG Tankers and LNG Tanker Cargo Equipment. In our experience, incidents during loading or off loading are often caused by a lack of knowledge and understanding of the different requirements and actions of onshore and offshore operators. There is a clear shortfall in knowledge throughout the industry in understanding the different approaches taken by onshore and offshore operators and we have taken measures to bridge that gap in order to ensure all considerations are addressed when designing LNG loading or unloading facilities. 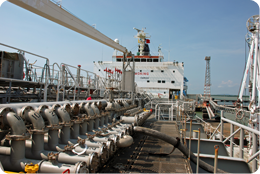 We are fully aware of the practicalities involved in operating LNG carriers and we have a detailed knowledge and understanding of the design and operation of LNG tankers. We have experience with the practicalities of alarm settings, trip settings and relief mechanisms. Copies of the SIGTTO approved certificates are available on request.